Second on the list for Maniacal Magento Mondays is Magento Daily Deal. 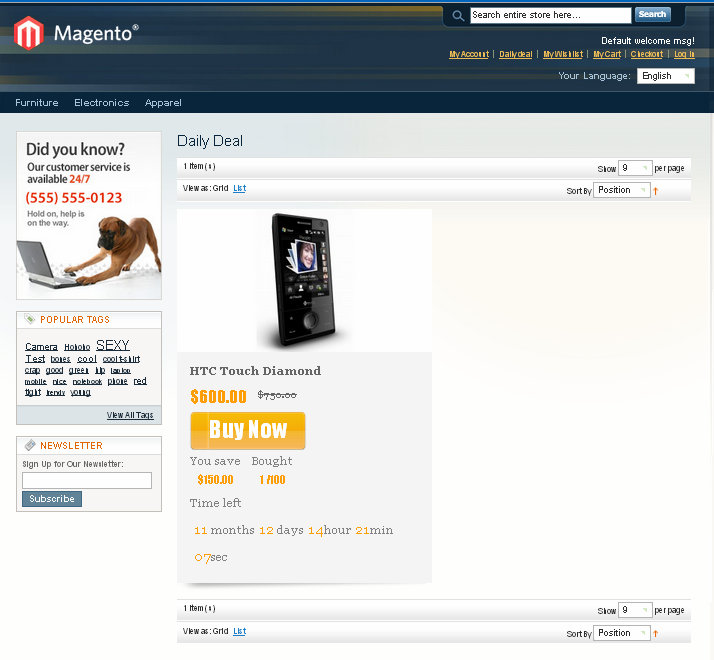 As the name suggests you can use daily deals to feature products and offer deals on you Magento eStore. Pretty handy right? You can both create and manage your deal with this extension and it is very easy to work with. What is most wonderful about this extension is that you can place the Daily Deals Widget on any page of your choice. Magento Daily Deals has something great to offer for anyone. As an owner for an online store you are always looking to get new customers as efficiently and cost-effectively as you want. By offering daily deals on your products you can attract new buyers and generate better sales. Simply think of the expense you would make to get your customers to your site and offer it in terms of discount. That way you are paying only if the deal performs. Great stuff is it not? Customers can easily view your added deals on the main page, the product page or on a sidebar. Additionally it makes purchasing much easier by filling in details of purchase on its own. The extension allows you to put up new deals every day, which will make your customers always keep coming back to get more. Create any sort of deal of your choice and manage them. If you have too big a catalog then you can easily add a random deal generator so that you can automate the process of adding deals. You can choose between showing deals on the left and right sidebar and control the number of deals you want to show on them. Deals can be set with start and end times so that you can automate the closing of deals. And lastly you the deals statuses can be switched after they are expired. 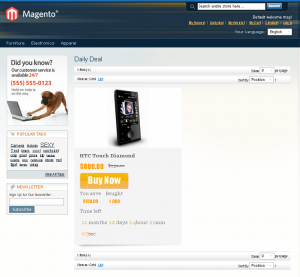 Our Magento Development team found it very enjoyable to work with Magento Daily Deals. It is very easy to install and configure and it already comes with its own encryption so you need not worry about adding your own. All in all a very high utility extension.